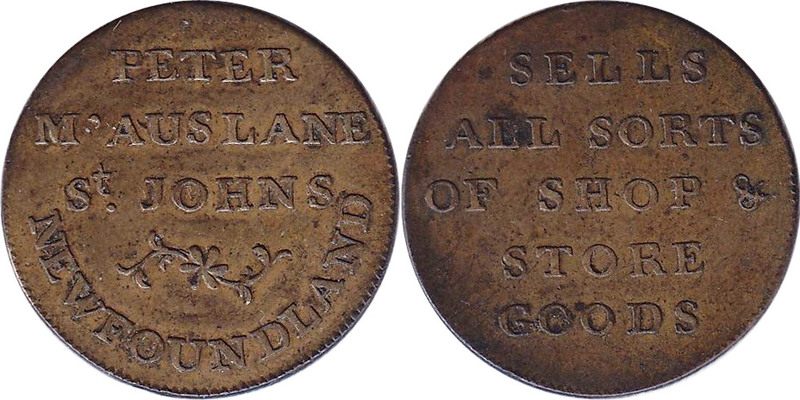 Peter McAuslane (1772-1842) was a merchant of Prince Edward Island, owned property in Charlottetown, a ship named the Hannah, and a farm at Rustico on what is today Robinson�s Island. According to Breton, the first example found its way into the collection of Mr. Robert IV. McLachlan in 1878, who reported on it in The Canadian Antiquarian and Numismatic Journal, VII, 2 (October 1878). A second specimen was discovered in 1893 by the Rev. Father Michaud of Montreal. The fact that McAuslane's store was destroyed by fire may explains its rarity. In 1925, a specimen was sold for $135 at Wilson Sale. In 2015, another one was sold for $51,600$. Those few that have been discovered in recent years have all been brought out of the ground by metal detectors on Prince Edward Island and they show cracked planchets and severely corroded surfaces.